HomeLovers is about satisfying the renting needs for students in Milan or for anyone moving into town for a short period. In fact, many are the studios and apartments available on the site, which have been carefully selected by a competent and experienced staff, daily handling the tasks of finding houses located in strategical areas of the city and in residential neighborhoods served by transports and stores. 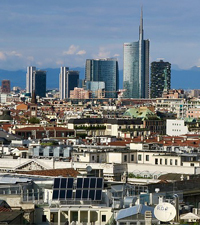 The studios for rent to students in Milan are furnished and include household appliances, broadband internet connection and a welcome kit with maps and brochures, featuring tips for getting around the city to the fullest. Looking for an apartment for short rent in Milan? The studios are ideal for college students and passing travelers, who need to settle in a cozy home environment for some time, but not on a permanent basis. The advantages of this type of accommodation are multiple (compared for example to hotels or other stays): first of all, studios offer more freedom of movement and privacy, as well as the advantage of not being subject to time or space-related constraints, therefore enabling one to invite friends, family or colleagues. Moreover, they ensure excellent value for money and can be remotely viewed and selected depending on the region and time of the year in which one plans to stay. Services offered by HomeLovers include cleanings (to be payed at check-in), three linen changes for bedroom and bathroom, unlimited wi-fi and maintenance in case of malfunctions.